> Detailed description and analysis of the main autoimmune diseases from a Chinese medicine perspective. > Diseases discussed in depth include systemic lupus erythematosus, rheumatoid arthritis, Sjögren’s syndrome, Crohn’s disease, Graves’ disease, and multiple sclerosis. > Full pattern identification and a comprehensive array of clinically effective treatment options for each condition, incorporating herbal medicine and acupuncture as well as diet therapy. > Extensive and informative selection of case histories demonstrating the translation of theory into practice. > Wide spectrum of up-to-date clinical experience from highly regarded Chinese sources, thus broadening the information available to practitioners outside China. > Practical discussion of the role of Chinese medicine alongside Western medicine. > More than 40 color photos. Shen Pi’an graduated in 1962 from Shanghai College of Traditional Chinese Medicine and since then has been working as a doctor in the Shanghai Traditional Chinese Medicine Hospital. He has been Professor and Director of the Rheumatology and Immunology Department at the hospital since the early 1980s. He is currently honorary consultant at the Diakonissen Hospital in Austria and has also lectured in Japan and Taiwan. 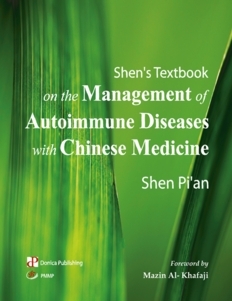 A prolific author, Professor Shen has written more than 10 books related to immunology, rheumatology and materia medica pharmacology. This is the first of his books to be translated into English.